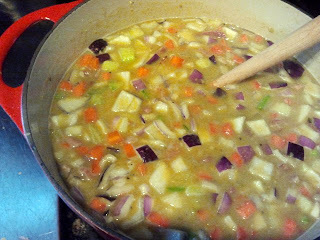 I just love split pea soup, and with the bone of our holiday ham sitting in the freezer just waiting, it was time to make a nice big pot today! here's the recipe, adapted from a handful of other ones on the internet. Ultimately, though, the trick to the rich flavor is a couple of spritzes of a good balsamic vinegar right before serving. Add the next eight ingredients; cover and simmer for 1 hour or until vegetables are tender. Spray the balsamic vinegar on before serving.